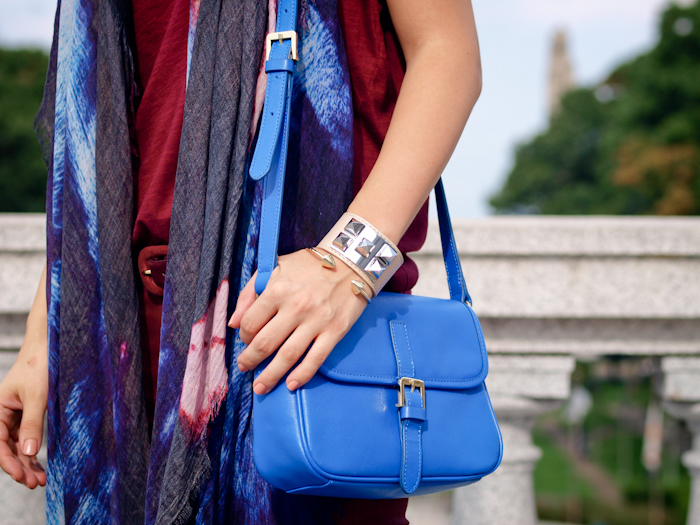 More is more when it comes to Fall's rich COLORS! I love Summer, for its pastel colors and easy fabrics, as much as I love Fall, for bold-bitter colors and" heavy "fabrics. Today's look is a slowly but surely transition of the seasons with H&M burgundy jeans and this Cut25 printed scarf. What is your favorite color for Fall? 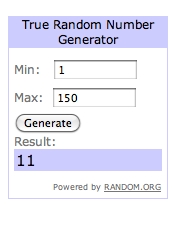 Today we have a winner of a wonderful BHLDN dress: Congrats Kimberly ! I will contact you soon for more details about your prize ! Thank you everyone for your participation ! I liked the detail in blue. Perfect combination! I like it ! 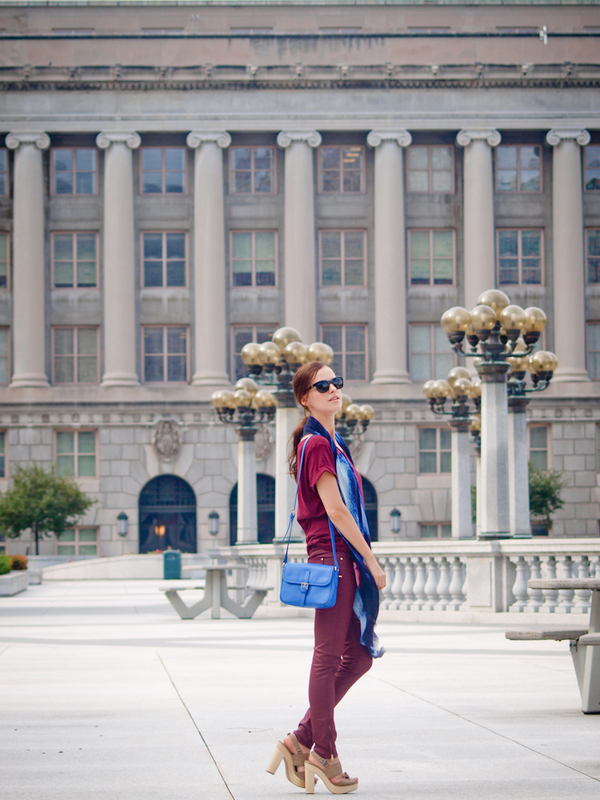 I am loving Burgundy for winter (or Fall as you call it! )…and it looks so fresh paired with that cobalt blue. Love it! Totally in love with the fall favourite shade! Looking gorgeous lovely! Beautiful deep red pants and shirt – and I love how you accented them with the pops of blue, especially this pretty scarf! Love the all burgundy look. The pop of blue is perfect! burgundy color is amazing for this season!!!! Your throwing a scarf over this outfit is the cincher. Cute blue bag. I’m also wearing blue and burgundy for fall. Burgundy and blue, what a lovely mix of colors! I really love your outfit. great combination of colors! you look stunning, as always! a nice pair of sandals and the first picture is oh-so-great! You carried off the color of fall/winter with utmost ease!! Love the outfit – the colors are stunning together and I LOVE those pants!! I love your blog, you have such great style! Veronica, you look fabulous! Love the burgundy pants! so chic and so, so perfect for this fall!